Are you planning to go somewhere for a summer vacation? 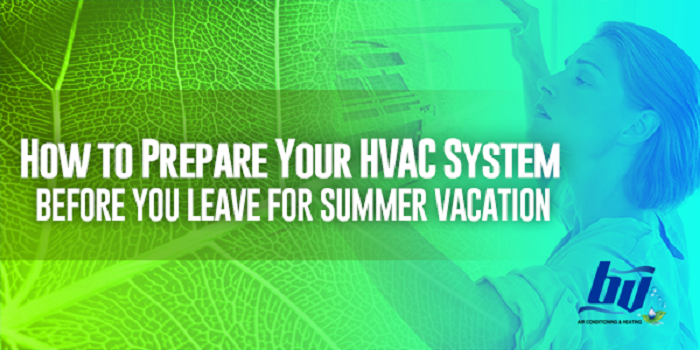 Whether it is an out-of-the-country tour or simply spending the entire week at the beach, it is vital to prepare your home and HVAC system in advance. Your absence can pose a risk both to your home and HVAC units so a little preparation would help. Check out these easy tips from BV Air Conditioning & Heating for a worry-free summer vacation. Before heading to your destination, see to it that your air filters are working properly. Provide replacement if necessary especially if it is full of dust and dirt. It will leave your home with fresh and clean indoor air. A clean air filter should go hand-in-hand with a clean unit. Set aside at least 15 minutes of your time to clean your cooling system a week before you leave. When you do this in advance, your unit works efficiently throughout the summer season. If you have a programmable thermostat at home, turn the temperature to 78 degrees while you are away. Doing this leaves your house comfortable and cozy when you get back from the vacation. Keeping your thermostat at the right setting helps you save more than half on your energy bill. To prevent power surges and damage to your HVAC system, installing a surge protector is the key. It works effectively in protecting your heating and cooling unit against electrical hazards and potential damages. As a result, you will not worry about going home with a broken system. Surely, you would want your HVAC system cleaned, checked and maintained properly. A tune-up service from a trusted HVAC contractor is what you need. Make sure to schedule it a week before your vacation, so they still have time to carry out necessary repair works and maintenance. Your summer holiday should be stress-free or else it wouldn’t be called a vacation, not at all. This is why it is necessary to do some preparation and pre-condition your HVAC system ahead of time. If you want to know more heating and cooling preparation tips, get in touch with BV Air Conditioning & Heating today! Our experts are trusted for their knowledge and experience in the field. Give us a call for all your HVAC needs.